Our cafe bar serves all day food, continental draught lagers, decent wines and fine Italian coffee. Eat and drink at The Brunswick Hotel’s cafe and bar ‘brutti ma buoni’ (ugly but good in Italian). At Brutti Ma Buoni our food is influenced by Mediterranean and local flavours. Our extensive menu is available all day every day from 11am to 10pm. We call it holiday style! Pets are welcome although prior notice is essential. 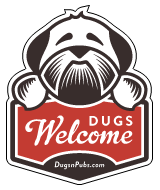 There are a total of 14 dog friendly listings in the Merchant City category. Please log in, or sign up as a member to view all listings.